Suede – crafted fat-tanned leather from reindeer, elk, goat and other skins. Its main characteristics are the smoothness, softness, porosity and water resistance. Products with suede, look beautiful and expensive. But, like all things, they tend to wear out and lose its original appearance. Independently to dye suede products without divorce is difficult, it is better to consult specialists. Specialized companies for suede a little, and not every city has them. And those that exist are not always endowed with the necessary equipment. Suede conservative colors (black, brown) to paint much easier, and the dry cleaners take it willingly. It is more difficult with colored things. On request your shoes, boots can repaint in the same black and brown. Sometimes it is the only salvation favorite spoiled things. For painting suede, a good option is to dye for wool. Before starting, suede clean from dust and dirt. If it is very dirty, wash it with a mixture of water and ammonia in the proportions 4 : 1 or a soap solution with the same ammonia. RUB the mortar with a rubber brush or sponge and immediately rinse in cold boiled water. Then buff the suede with a dry, soft lint-free cloth and some time will hold over steam. Before the main cleaning grease stains sprinkle talcum powder. For painting suede the above mentioned method mix in an enamel pot 1 sachet of one and a half litres of distilled or boiled water. Further, following the instructions, add the vinegar. Then begin to RUB into it the prepared solution. Fluid temperature should not exceed 50 degrees. Repeat this procedure 3 to 4 or more times with an interval 15 – 20 minutes. After staining, wipe the thing with 1-2% solution of vinegar, rinse under running water and dry. Now in stores sold a huge amount of money for painting suede, differing from each other by way of application, price and quality. These include: special aerosols, sprays, balms – reducing agents and liquid paint to refresh the suede. Dyes included in their structure, penetrate deeply into the structure of matter and provide it with stable and uniform color. Good result reaches the spray suede. Brush the surface and spray at a distance of 20 cm Fixture is very easy to use and dries quickly.When working with liquid paint squeeze bottle with a sponge down to the product and apply evenly on the treated area. Always clean suede before any kind of painting.As you can see, tools and techniques painting suede to present sufficient variety. It is only necessary to correctly choose and correctly apply. The main thing here is not to miss with a color, otherwise you may get unpredictable result for you.To return the original appearance to suede products problematic. Heavy contamination is usually not stained completely. Here you will not help even a special brush for suede. So it is easier and it would be better carefully take care of them from the first day of purchase. Do not dry leather things on the battery. Better buy a special dryer for them. Brush the suede in a dry state porous or rubber brush. Apply sprays for impregnation. Avoid touching suede leather with water. Suede shoes looks very rich. True, and care for her needs more thoroughly than shoesth from other materials. In order to keep shoes in order it is recommended to use special protective sprays, they not only protect the shoes, but also freshen the color. But what if the color of the Shoe has become too faded or want to repaint the suede in a different color? Paint suede shoes is not so easy. To dramatically change the color of suede shoes, it is better to contact to the dry cleaners or the house of life (if such still remain in the city). But it often happens that pick up the paint color even there is hard enough. Two colors that don't have problems, it is brown and black. If you want to paint suede shoes at home, choose the right paint, in consultation not only with sellers, but and Shoe shops. The latter often have to work with shoesYu, they are better versed in the peculiarities of the material and its wear. Make sure that the store you took it to the paint for suede, and not an ordinary composition, refreshing the original color. Specify whether the shed product after painting tool. Well established German and Italian paint. Usually recommended for painting rules paint is not enough to satisfactory result, therefore it is better to take the paint off the stock. Do not apply indoors. Compositions for dyeing suede have a fairly pungent odor. Apply suede shoes with gloves on. Before proceeding to the painting (especially if you use a paint-spray), make sure that the floor or furniture on which you are staining, protected. Spread the newspaper or plastic bag. Prepare the shoes for dyeing. Suede needs to be clean and dry. Treat the surface with a special brush for suede with fleecy bristles or with rubber "teeth". If necessary, use other means for a more thorough cleaning suede. Apply the color to the shoes very slowly and carefully, progresiva suede. Leaving no streaks, apply a uniform layer of paint, holding the can of spray at the same distance on different sites. One layer for the full painting is not enough. Wait a bit until you fixed the first layer, then apply another. The number of layers, define their own, focusing on the resulting effect. If you dye the shoeswhere you long from socks appeared shiny places, treat them with a brush dipped in paint. The junction between the shoesand the Welt is also recommended to paint with a brush. Support obtained after staining the color of your suede shoes with protective compounds. 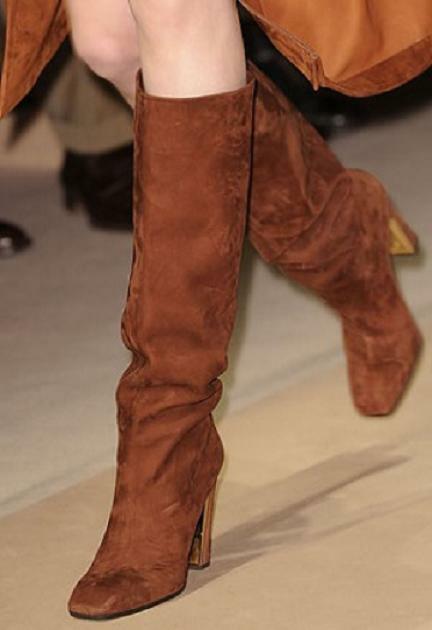 Suede boots and shoes, of course, very spectacular and beautiful. However, her owner regularly faced with the challenge of caring for these products. Especially often suede shoes tint. Sometimes, in order to entirely change the color of the boots. Sometimes to only update. And it can be done in different ways. If you just want to give your boots a more intense color or to eliminate any that appeared in the process of wearing defects, then paint them will not be easy. To do this, you must purchase the appropriate color of your boots, paint and apply it on suede. Remember that the paint should be in the tank in the form of a spray. Just spray it on the boots, carefully painting over the damaged area. If you want to radically change the color of your suede boots, you will also come to the aid of an ordinary paint for shoes. The easiest way to repaint any of the boots in black. To do this in any Shoe Department or store buy specialized paint spray black. Then proceed directly to the staining. For this cover in the room where you paint, the floor with Newspapers or plastic wrap, put on rubber gloves. Grab boots and begin to apply the paint. The movement should be smooth and careful on the boots did not appear divorces. Ideal would be if you paint over one lane and give a little bit - about 5 minutes - it dry. And only then apply the second. So you clearly will see them on the Internet and will be able to more smoothly apply the paint. After dyeing, allow the boots to dry and then evaluate the result. If you see a flaw, fix it with paint. Brown boots would you do if you paint the white suede in the same specialized spray. Paint technology is the same as in the first paragraph. If you yourself do not trust or are simply afraid to ruin the shoes fact that you do it stains the paint, give case painting professionals. Take your boots in any Shoe repair. And the next day you will get them in a new color or updated the old one. However, this method (repainting) too, unfortunately, does not guarantee a perfect result. Can try to recolor your boots in special factories for the production of suede. Of course, this service will cost more than in a normal Shoe repair, but the result will be much better. Don't forget to prepare your boots to paint - allow to dry and clean. If they had the gloss, be sure to scrub the damaged area to a regular school eraser, then treat the boots with a special brush designed to care for suede shoes. And only then start painting. If you follow all the rules of preparation for painting, you will get a perfect result.